Saturday I had the pleasure of hosting my Book Club's monthly meeting. I changed things up from our normal evening of wine & food and hosted Brunch. It was so fun! 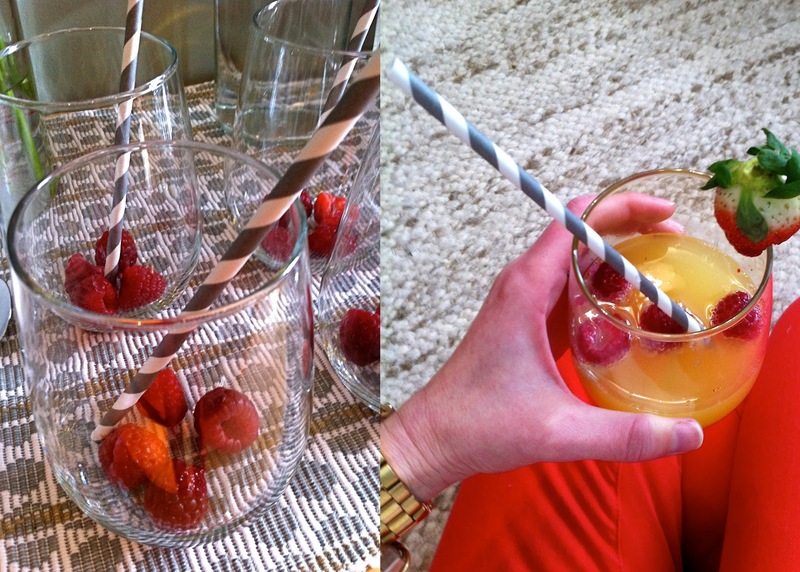 I had a blast planning a menu, figuring out drinks and what to have on hand for all the ladies! We started with a full variety of drinks. Hot drink options of coffee & hot cider. Cold drinks of Mimosas (duh! ), and I had chilled water (plain and a pitcher with sliced cucumbers). Then it was time to eat!!! There was a tower of glazed donuts. A yogurt bar: plain yogurt with granola, berries and honey. Fresh Fruit kabobs. A mountain of croissants, with strawberry preserves & butter. And of course the bacon....bacon and sausage. Beyond the mimosas, which are always the BEST.THING.EVER!!! 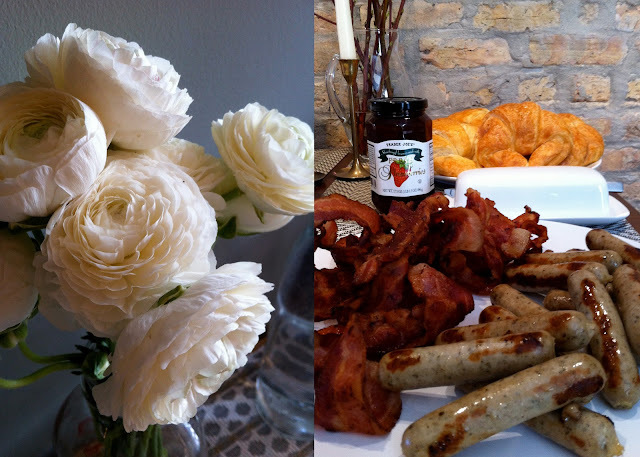 The fresh flowers, and the mountain of bacon hit high up on my list! I am ready to host my next girls night, brunch and dinner party! I don't get to host people near enough! Time to change that!!! Oh man, I wished I lived in Chicago. Lovely spread. This looks like the most adorable brunch, I love it! Thank you love!!! I had such a fun time! I really want that plate of bacon right now. Oh man. Looked like a Taylor" party.....perfect ! Wish I had been there ! my girlfriends and i just started our own book club! what was the book this month? What a gorgeous and yummy spread! what a cute idea! i wish i was in your book club! Sitting here at my desk, drinking my protein shake and getting very hungry! Looks like a perfect spread! It was so good! :) Thanks again for hosting. Let's get together again soon! Wishing I were in Chicago so I could have attended this brunch! Looks divine! This looks absolutely delicious -- glad you had fun! This looks like so much fun! I love a good brunch- and love a good mimosa even more! I recently moved to Chicago and I am missing my brunching gal pals back in NYC. It's nice to know that midwestern ladies know how to make a good brunch, too!!! So much fun - I just joined a book club in Chicago too. This post has some great inspiration for when I host! I love this brunch idea! We always do evenings...definitely going to steal this idea the next time I host! looks excellent! very well done!